Guided tour "Brussels 1900 - Art Nouveau"
Over the last 40 years, this coach tour has proved the most popular and wellknown of ARAU’s tours. 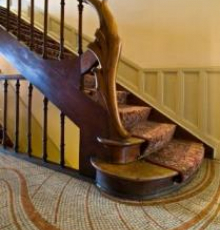 The tour helps participants to understand the place of Art Nouveau in Brussels, its origins, its technical and stylistic characteristics, and the personalities of its most wellknown architects. The tour travels through several districts of the city to show participants beautiful Art Nouveau facades, some of which are UNESCO world Heritage Sites. The tour also offers the chance to visit extraordinary Art Nouveau interiors, including some not normally open to the public. Each tour includes at least two interiors from the following list, subject to availability : Victor Horta’s Van Eetvelde house, Autrique house or Waucquez store (now the Belgian Strip Cartoon Centre), Henri Jacobs’ Schaerbeek School No.1 or School No.13 or the former Institute of Sociology by Constant Bosmans and Henri Vandeveld.